The Summer Blockbuster Movie Season keeps on rolling! In fact, that brings us to our latest recipe for Cars 3! We love creating recipes inspired by Disney and Pixar films. They have such deep levels of story telling to them which makes it easy to theme an item. 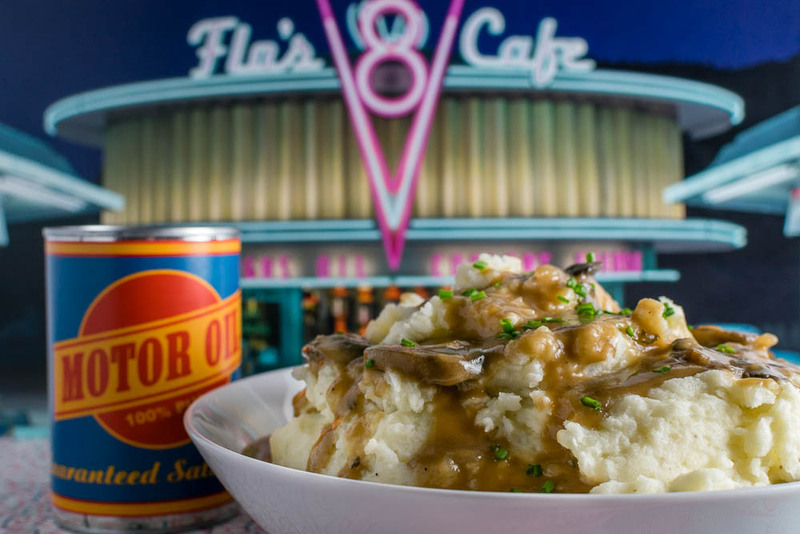 The inspiration for our our Cars 3 inspired recipe, Flo’s Mashed Potatoes and Motor Oil Mushroom Gravy, came from Flo’s V-8 Diner and is sure to keep those motors going! 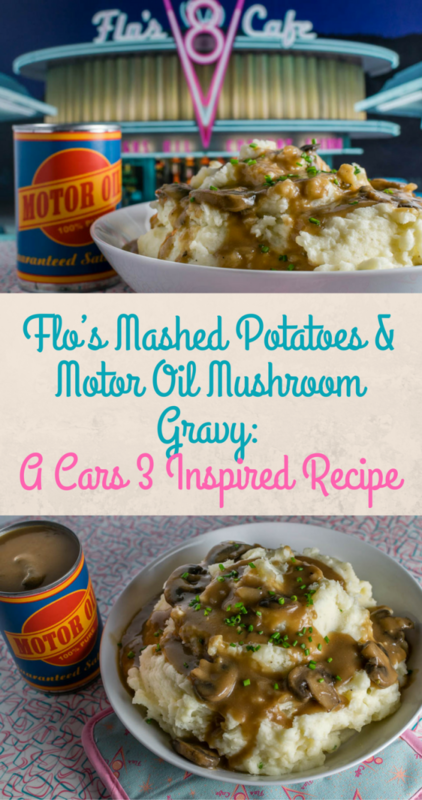 The inspiration for Flo’s Mashed Potatoes and Motor Oil Gravy comes from a couple things. The first is of course Flo’s V-8 Diner in the original Cars film. Flo’s is an integral part of Radiator Springs and we wanted to acknowledge that. The gravy is a riff on the motor oil she’d serve her customers. The second is Flo’s V-8 Diner in Cars Land at Disneyland. 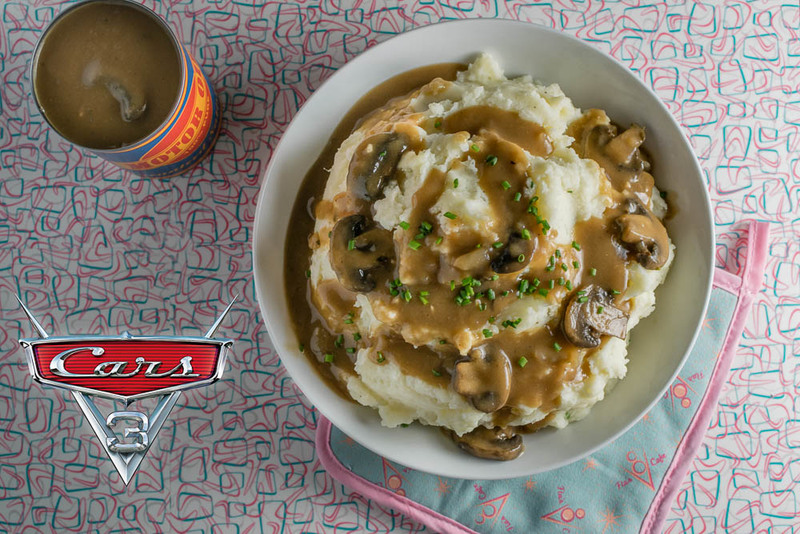 The restaurant in Disney California Adventure serves classic diner favorites like our mashed potatoes. 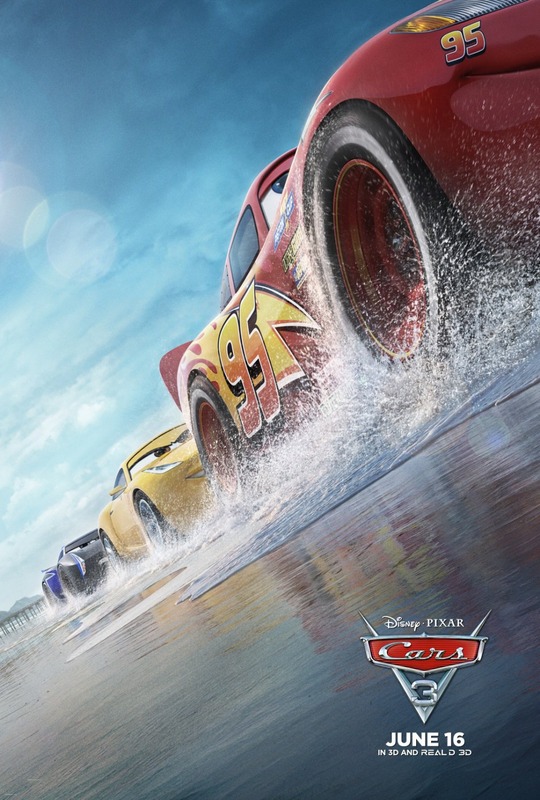 In addition to our tasty Flo’s Mashed Potatoes and Motor Oil Mushroom Gravy recipe, we are giving away 5 family four packs of screening tickets for a sneak preview of Cars 3. The screening will be on Monday, June 12th at 7 pm at AMC Arizona Center. Winners should arrive at 6:30 in order to guarantee their seating. Winners will be selected on Saturday, June 11th. Good luck! Put potatoes in a large pot and add enough water to cover. Add salt to your water. Reduce heat to medium-low; cover loosely. Boil on medium low for 15 to 20 minutes or until potatoes are tender. Return potatoes to pot and add milk, butter, garlic powder, salt, and pepper. Mash until you've reached your desired texture. Saute mushrooms in a frying pan until they are cooked down, set aside. Stir to incorporate and form a roux. Continue to stir until roux becomes dark brown, 6 to 8 minutes. Add onion powder, garlic, and thyme and continue to cook, stirring often, until garlic is fragrant, about 1 minute. Pour Worcestershire sauce into pan and cook until nearly evaporated, about 1 minute. Add beef broth and mushrooms. Bring to a boil, reduce to a simmer, and continue to cook until sauce has reduced, about 20 minutes. If your gravy isn't thick enough mix cornstarch and water in a small bowl until combined and add this mixture to your gravy. I love this, it is so creative! We were just at Disney and my little one loved the cars section at the resort we stayed at. She has been super into cars lately. I can’t wait to make this for her!